To gamers, charisma is simply a skill to level up in order to progress in your game. In the “real” world it is a natural skill that some people possess, while others are left lacking. 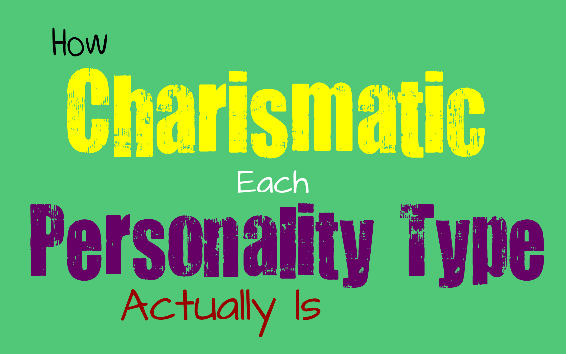 Here is how charismatic each personality type is most likely to me. INFJs are often very good with people, they just tend to avoid them. They enjoy spending their time alone, and might prefer to only be around a select few people. INFJs can be good at communicating with people, if they push themselves to do so. They have a natural way with words, which can make them rather charismatic in certain situations. This makes them skilled at navigating the people around them and finding ways to present themselves, however necessary. INFJs in their natural state may not be the most charismatic, since they often have a nerdy side to their personality. When they are comfortable with someone, the INFJ unleashes a more relaxed and honest part of themselves. There is something about the INFJ that is beyond charisma, but is actually like being sucked into another world- if they so choose to let you into this world that is. ENFJs are naturally good with people, and have a charismatic way about them. They are often entertaining, and great at being the center of attention. They often do not put themselves in the center, but others find their personalities so delightful, that they enjoy listening to them. ENFJs are great at commanding a room and helping to create a positive emotion around them. This causes other people to truly enjoy the presence of the ENFJ and their naturally charismatic ways. Their natural way with people and their understanding of the emotions of others, makes ENFJs extremely charismatic people. INFPs may not see themselves as charismatic people, since they have a somewhat offbeat sense of humor. Their unique and sometimes quirky ways, causes them to draw in people who are intrigued by just how special they are. This however, might cause the INFP to be less charismatic, and somewhat awkward around strangers. They are often very funny people but might not show this part of themselves with everyone that they meet. INFPs often save their more charming side for a special few individuals who get to witness it. ENFPs are extremely charming individuals, and often have a way of keeping people interested. They can often use their charismatic personality, as a way to get whatever they want from people. ENFPs are generally good people though, which makes it less dangerous that they have such a natural ability to convince others of whatever they so choose. They do have a somewhat awkward and silly side to their personality, but that does not mean the ENFP does not know how to charm the pants off of just about anyone they meet…figuratively speaking (and probably literally as well). INTJs might not naturally be charismatic people, especially since they enjoy spending most of their time alone. They do however, have a skill for learning and understanding various situations. An INTJ who has spent time mimicking others, might have some acting abilities which makes them more charismatic. They might not always attract their desired audience with their charismatic performances, but the INTJ has an excellent way with words. The more approachable INTJ, is going to be great at talking their way in and out of many different situations. Their intelligence can be a great asset to them as far as convincing others of whatever they desire. ENTJs have very larger than life personalities, and are often excellent at commanding a room. They are naturally charismatic people, and are great at keeping other people entertained. ENTJs know how to get what they want, and may use a more intimidating approach in order to keep people under their thumb. Ultimately though, ENTJs are likable folks, with a naturally large sense of humor. They are excellent at conversing with people, even strangers if they feel it is necessary. Their charismatic ways often help the ENTJ navigate many different social and work situations. INTPs are often viewed as more awkward, than they are charismatic. This does not mean that INTPs are not extremely likable- in fact many people find that the INTP has an intense way about that which draws them into their gravity. They simply do not enjoy forced social situations, and might find themselves preferring to keep their thoughts to themselves. The inner mind of the INTP is an incredible place, filled with creative thoughts and ideas. They are not always the most approachable people, but this is simply because those are the vibes they are putting out there in order to keep people at arm’s length. ENTPs are extremely charismatic people, and naturally find themselves becoming the center of attention. They often have rather on point senses of humor, leaving the entire room in stitches. ENTPs know how to communicate with others, and are great at convincing people of whatever they please. Their intelligence, combined with their observational skills- makes ENTPs amazing at figuring out exactly how to operate around other people in order to make them more likable to them. The ENTP often has a way of making people enjoy their presence, even if those people are angry with them. ISTJs are often seen as the worker bees of the world. They are constantly pushing themselves to get things done, and are focused and organized people. They enjoy spending much of their time alone, and only want to be around a select few individuals. ISTJs may not be the most be viewed as the most obviously charismatic people, but they do have a natural way with communicating. They are often comfortable with holding conversations in a rather intelligent way, which helps them move up in their careers, and even impress potential romantic partners. They may not have a natural jaw dropping charm, but ISTJs are actually very good with people. ESTJs are generally very focused on communicating with other people, and are naturally outgoing. They can sometimes be seen as loud or overbearing to some, but are extremely likable and entertaining to others. They have rather larger than life personalities, which can cause them to rub certain individuals the wrong way. For those people who enjoy the ESTJs brand of humor and communication, they are seen as extremely charismatic. They are often well-liked in their community, and are excellent at commanding a room. ISFJs are not the most outgoing people, but they are often extremely likable. Their kind and generous ways, often cause others to truly enjoy having them in their lives. ISFJs don’t go out of their way to make their presence known, but they have a silent charm that often goes over very well with others. Their family members however, might find their behavior to be a bit overbearing- since the ISFJ is constantly trying to tend to the needs of their loved ones. This comes from a place of caring, but can be difficult for certain personality types. ISFJs however, are very warm people- which often makes them well-liked. ESFJs are often great at understanding the emotions of others, which can make them naturally charismatic people. They can often observe a room, and find ways to affect the emotions of their surroundings. Their understanding of others, can help the ESFJ appropriately respond in order to receive a positive reaction. With the right amount of effort ESFJs are charismatic people, especially if they want to be. They may however, find themselves largely distracted by their surroundings, making them more focused on getting things done. ESFJs simply want to make others happy, especially their loved ones. This might cause them to appear needy from time to time, especially if they feel like they could be doing better. ISTPs keep to themselves most of the time, and prefer spending time alone. Although ISTPs do not surround themselves with people- they can be rather charismatic when they do decide to emerge from hiding. People are often drawn to the ISTPs bad boy/ bad girl appearances- and find themselves completely in awe of their cool personalities. Sometimes ISTPs actually find themselves drawing in more attention than they want, simply because of their natural charm. ESTPs a naturally extremely charming individuals, especially when they are going after something that they want. ESTPs have a way with words, and a natural ability to charm those around them. This often makes ESTPs very good at manipulating people, if they do desire. They are seen in television and books, as the more charming and suave characters- with extremely smooth personalities. ESTPs are fun and adventurous, which only adds to their natural charisma. ISFPs are generally shy individuals- who prefer to spend their time alone. They do have a natural charm about them, but they often keep this part of themselves quiet. The ISFP can sometimes be seen as awkward though, especially if they have spent far too much time by themselves. They know how to make people like them, and often use their creativity as an outlet to approach certain social situations. ESFPs are the natural entertainers of the personality world- and truly enjoy making other people smile. They are great with keeping people entertained, and find themselves being the center of attention most of the time. They do have a charming way about them, especially since they are entirely fearless when it comes to approaching others. The ESFP is not afraid of taking chances and embarrassing themselves- which actually makes them rather charismatic most of the time.